Music and maps. Geography and the arts. They may or may not seem like natural partners – music is about cultural and creative expression, and the general rhythm and tune to life; the other is about precision, accuracy and scientific understanding of the processes and reality of the world around us. However, as I’ve discussed in the past, there are very strong links between the two – the list is endless of number of songs that mention ‘places’ (e.g. London Calling, Born in the USA, Straight Outta Compton etc). That’s before we consider geography’s influence on musical genres and creative centres. Those who are into their indie music may have noticed the earlier reference the New York band’s 2003 indie classic, ‘Maps’, which helped Yeah Yeah Yeahs break onto the scene. With the hook chorus, ‘Maps, Wait, they don’t love you like I love you’, there perhaps isn’t a better ode to mapping and if I ever get round to a mapping podcast/video channel is an ideal theme tune. Led by singer Korean/Polish-American Karen O, with Nick Zinner, they helped form the band whilst at art college at turn of the millennium, and soon ended up supporting The Strokes and The White Stripes. A legend in the disco, funk and R&B scene with the band Chic, and later collaborator with many iconic names such as David Bowie or Diana Ross, and more recently Daft Punk and Lady Gaga – Nile Rodgers’ portfolio as musician and producer is impressive to say the least. 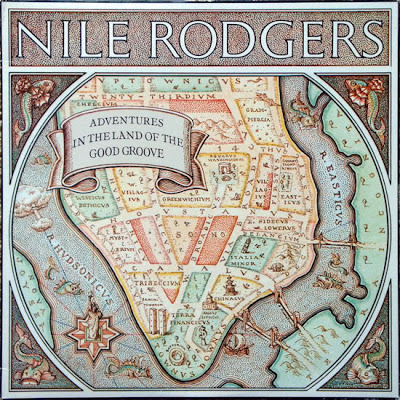 Also impressive is the clever old school style map on the front cover of his debut solo album – ‘Adventures in the Land of Good Groove’. The album title sounds like a medieval quest-come-funk, and sticking with this theme is the 16th-17th century style map. What looks at first like a generic place, reveals itself on closer inspection to be Nile’s home city of New York – with the ‘Hvdsonicvs’ (Hudson River), the Village, Greenwich. The compass stylised as the Statue of Liberty is a particularly nice touch. 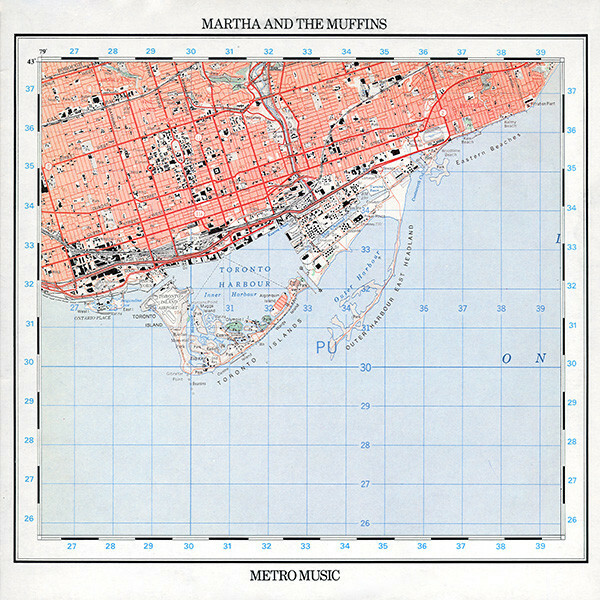 Sticking with album cover themes, Canadian band, Martha and the Muffins, went more contemporary and topological with the cover of their debut album ‘Metro Music’. Featuring a simple, but cartographically pleasing map of the band’s hometown of Toronto, it is based on a map from the National Topographic System of Canada, produced by graphic designer Peter Saville. Outside of Canada, they are known as a ‘one-hit-wonder’, thanks to their fantastically catchy and quintessential new wave hit ‘Echo Beach’, which sounds as fresh as it did in 1980 (the single cover also had a map!). The song refers to not a real beach that actually exists, but drifting away to somewhere else there narrator rather be. The writer in reality was referring to Sunnyside Beach on Lake Ontario – the shoreline of Toronto as referenced on the album cover. Ironically, an outdoor concert venue in Toronto in 2011 was named ‘Echo Beach’ – geography imitating art. The second artist in this list to have a song called ‘Maps’ are pop rock outfit Maroon 5, hailing from Los Angeles. However, unlike Yeah Yeah Yeah’s song of the same name, the lyrics do relate to maps in their conventional form. The song is about the search for love, one that has been lost – with lead singer Adam Levine singing in the chorus : “All the roads you took came back to me / So I’m following the map that leads to you.” Give the common themes in pop music of searching for love, it is maybe a surprise there aren’t more songs called ‘Maps’. Crossing to the other side of the Atlantic, and we have the indie rock band from Deptford in South London in the form of Athlete. Tucked away on their breakthrough 2nd album, ‘Tourist’ (a very geographically inspired name to begin with), is an album track called ‘Street Map’. On a strong album that explores themes of travelling, family, and homesickness, Joel Pott gets to our innate need for maps to guide us to somewhere familiar, singing “I would like someone to make a map, Mark my home and draw some lines that match.” Maybe I’m getting too deep into the mapping and music theme here! However, geography is arguably a reoccurring feature for Athlete – with songs from other albums including ‘El Salvador’ and ‘Hurricane’. Previous Post: Map of The Month – August 2018 – You Decide! Maroon 5 is really something, I love their music.